It is well known, that the gossip always contains an element of truth, while slander is closely related to the calumny and is almost always intentionally false. Aristotle noted that in a free and equal society resentment is generated by envy, and selfishness. On January 21 of each year, in commemoration of St. Agnes, about two hundred brotherhoods-congregations, gather In Aquila to indulge in a libertinage sarabande and unbridled "slander" evoking a unique tradition that has its roots in the dawn of time. Some are offended by it, others wonder why the "slandering" has become a tradition. 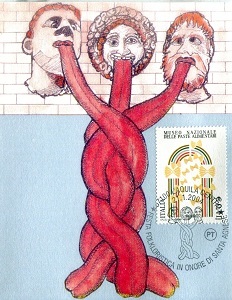 If tradition means the "passing on" of a certain behavior or positive events to subsequent generations, then slander, some other say, may be an element of cultural heritage, therefore, every year an award is assigned to those persons who thought the year distinguished themselves for having "a big mouth" (la lingua lunga-long tongue). 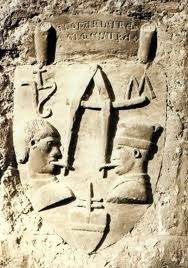 Origins: It is the year 1300 or so, and ...just think what was the favorite pastime of some bourgeois of that period? Gossiping of course. ... to talk about this and that, but also about politic, deeds and misdeeds occurred to acquaintances or people they never meet or never existed, of women and... cuckold husbands (in fact there is another event known as the "Festa dei Mariti Cornuti"- Feast of Cuckold Husbands, in the city of Pescara, second week of November). Indeed, slandering was their favorite pastime, and no one was spared....including the local ruling class who tired of being targeted decided to take drastic measures. Anyone caught "slandering" would be banned from the city, and anyone who dared to return would be put to death. The furious protests of wives, mothers, fathers and sons forced to live far away from their loved one was such that the local government was forced to allow the return of all those banned fellow citizens on the condition that they never again would gossip about other people. The "home coming" date was set on January 21 and came to be known as "Quiji de Santa Agnes" or Agnesini ( Day of Santa Agnese). Of course, as the old say goes, a wolf changes his coat but not his habit ("jiu lupe perde jiu pilu ma no jiu vizio"). And so it was that, respecting the oath to not continue their "pastime" inside the city walls they found a way to continue the tradition of slander outside the same. A table was set up just outside the wall, with wine and food ...and the tradition continues. Today friends gather together to commemorate the events in front of the inevitable local dish, La lingua, (beef tongue) cooked according to the chosen restaurant. Events taking place in the Region.